The upcoming Mahindra XUV300 will be available in both 5 and 7 seat configurations. Our homegrown carmaker Mahindra and Mahindra is shifting its entire focus towards the development of SUVs. The company plans to launch several new SUVs & crossovers over the next 2 years. Our regular readers will be aware of many such examples as we bring you the latest reports on a daily basis. Let’s start our journey to unravel the facts pertaining to the upcoming 2018 Mahindra XUV300. If reports are to be believed, the 2018 Mahindra XUV300 will be launched sometime in the initial half of the year. Mahindra plans to showcase the upcoming compact SUV at the upcoming 2018 Auto Expo slated for early next month. The exact launch date will be available post the expo. We expect Mahindra to price the XUV300 competitively with the prices starting at INR 8 lakh for the base model and INR 11 lakh for the top variant. The upcoming 2018 Mahindra XUV 300 will share its underpinnings with the Ssangyong Tivoli. Based on the flexible X100 platform, the XUV300 will have a lot in common with its cousin. 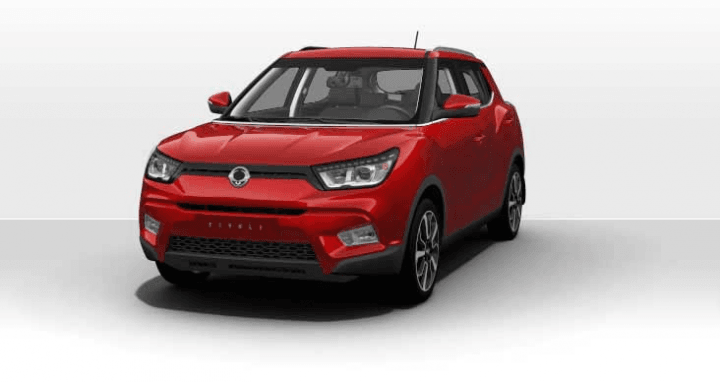 The Ssangyong Tivoli’s length is already over 4 meters and as per Mahindra’s plans, the company will have to focus on modifying the platform to shorten its length to under 4 meters. The compact SUV will be available in both 5 and 7 seating layout with the under 4 meter offering the former and the 7 seat option will stay exclusive to the over 4-meter variant. Since the XUV300 will be based on the Tivoli, it is obvious that a lot of parts will be carried over. To retain the XUV design language, the XUV300 will feature slight tweaks like the new front grille. Overall, the XUV300 will look identical to the Tivoli. The upcoming compact SUV will feature a sculpted bonnet, sweptback headlamps featuring daytime running lights, fog lamps with chrome surround and big bumpers with skid plate to enhance the character of the SUV. Going by the spy shots we have features so far, the upcoming compact SUV will feature integrated roof spoiler, flared wheel arches, muscular design, aggressive bumpers and LED lights all-around. We expect Mahindra to offer exterior personalisation options like Maruti does for Vitara Brezza and the Ignis. The upcoming 2018 Mahindra XUV300 will feature identical interior to that of the Tivoli. We expect the company to customise the interior colour theme to match the XUV lineup. This translates to new premium upholstery with customisation options, chrome/piano finish inserts in the dashboard and updated electronics. The upcoming SUV will feature a 7-inch infotainment system with Apple Car Play, Android Auto and onboard navigation. The infotainment touchscreen will also double up as the display for the reversing camera. Interior feature list includes steering wheel mounted controls, automatic climate control, rear AC vents, leather upholstery, electrically adjustable driver’s seat, keyless entry with push-button start, reversing camera etc. The most interesting aspect of the upcoming 2018 Mahindra XUV300 lies under its bonnet. The compact SUV will feature the latest lineup of engines from Mahindra. The all-new 1.5-litre TGDI petrol engine was supposed to power the upcoming SUV but its still under development. Mahindra could use the all-new 1.2-litre turbocharged petrol engine featuring direct injection. Upon launch, this engine will be the most powerful engine in its segment and is likely to churn out around 140 bhp of power. Comparing the new 1.2-litre turbocharged engine to that of the Ford Ecosport’s latest Dragon engine, the former will make almost 25 bhp more power than the one in Ford. Exact numbers will likely be revealed at the showcase during 2018 Auto Expo. India being a diesel-centric market, this part should interest more of you. The all-new 1.5-litre turbocharged four-cylinder diesel engine will power the upcoming XUV300. The 1.5-litre unit is essentially a bored out version of the 1.2-litre mFlacon engine that does its duty in the KUV100. Mechanical changes include a bigger turbocharger and an extra cylinder to produce close to 125 bhp of power. Transmission options on the upcoming XUV300 to include a 5-speed manual, a 6-speed automatic and an AutoShift automated manual transmission. The engines on the upcoming Mahindra XUV300 are likely to favour fuel efficiency. The 1.2-litre petrol engine is likely to deliver 17-18 kmpl of mileage and the new 1.5-litre diesel unit will likely offer 21-22 kmpl of mileage. Mahindra will be loading the 2018 Mahindra XUV300 to the brim with tech. These include several safety features like dual front airbags, Anti-lock Braking System(ABS) with Electronic Brake Force Distribution (EBD) and these features will be offered as standard. The top of the line model will feature side and curtain airbags, Hill Launch Assist, Electronic Stabilisation Programme (ESP), rear parking camera with all-around sensors. Deriving its parts from the Ssangyong Tivoli, the upcoming 2018 Mahindra XUV300 will feature disc brakes on each end. The suspension duty will be taken care by McPherson independent suspension at the front and Multi-link type suspension at the rear. The compact SUV will feature anti-roll bars at each end to make the ride more stable and to avoid excessive body roll. Since Mahindra plans to launch two variants of the upcoming 2018 Mahindra XUV300, the competition is bound to be versatile and fierce. The under 4-meter XUV300 will lock its horns with the Tata Nexon, Maruti Vitara Brezza and Ford Ecosport. The over 4-meter length variant will likely compete with the Hyundai Creta offering an extra row of seating to its customers. The first launch this year from Mahindra’s stable will be the U321 MPV that will be slated between the Maruti Suzuki Ertiga and the Toyota Innova Crysta. The upcoming MPV will be an all-new model and will hold a seating capacity of about 7 people. Another upcoming SUV from Mahindra is a rebadged Ssangyong Rexton that will be sold under Mahindra’s brand in India. The SUV will be identical to the Rexton except for the Mahindra badges replacing the Ssangyong ones. Upon launch, the Mahindra Rexton will be the most powerful and the most premium vehicle in Mahindra’s stable. The Rexton will lock its horns with the Toyota Fortuner, Hyundai Santa Fe, Ford Endeavour and the latest entry to full-size SUVs, the Skoda Kodiaq. Another premium luxury SUV or we should rather say SAC (Sports Activity Vehicle) will be based on the Mahindra XUV Aero Concept showcased at the 2016 Auto Expo. Finally, the most awaited launch from Mahindra is the upcoming 2018 XUV300 mini SUV. The Mahindra XUV300 will carry the ‘XUV’ nomenclature forward. Based on the Ssangyong Tivoli, Mahindra plans to launch two versions of the compact SUV. A 5 seater version will be under 4 meter in length competing with the likes of Tata Nexon, Maruti Suzuki Vitara Brezza and Ford Ecosport. The over 4-meter version of the upcoming XUV300 will offer three rows of seating and will cost considerably more as it will attract higher taxes. Stay tuned latest news updates on the new Mahindra XUV300ti.